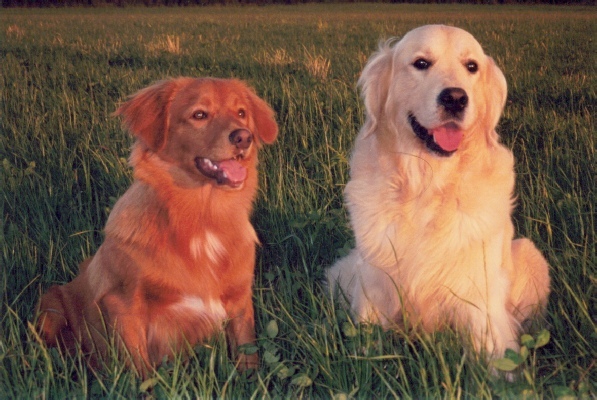 We have created this web site to share with you our passion for the Golden Retriever and the Nova Scotia Duck Tolling Retriever. For the last 40 years a Goldie (or 2...) has been a member of our family and more recently the Toller has joined our clan. We came to France in 1986 bringing with us our Goldies. We set-up a dairy farm and had our own family. In 1996 Daley arrived from the Jamoon kennel in England and became our foundation dog in France. As our new Goldie family increased and we gained experience in the French show ring and on field trials the " of Clan Buchanan " kennel was created. Two years later we decided to do something to help a rare breed and after opening a magazine by chance on a photo of a Toller we fell in love with this fox like dog. Polo, from the Decoymans kennel became our first Toller.